Blue skies and bright sunshine are great for tourists, but they can ruin a photographer’s day. Granted, warm sunrise and sunset light casts dramatic shadows and warms the landscape for a few quiet minutes at the beginning and end of the day. But when the sun is up, the light is harsh and tourists swarm like ants to a picnic. On the other hand, an overcast sky diffuses sunlight, diminishes shadows, and softens the landscape. While diffuse overcast light isn’t usually as dramatic as warm early and late direct sunlight, it’s always wonderfully photographable. It also keeps the teeming masses at bay. If given a choice between dramatic sunrise and sunset light bookending a day of blues skies, or a full day of flat, overcast light, I’d take the overcast day without hesitation. 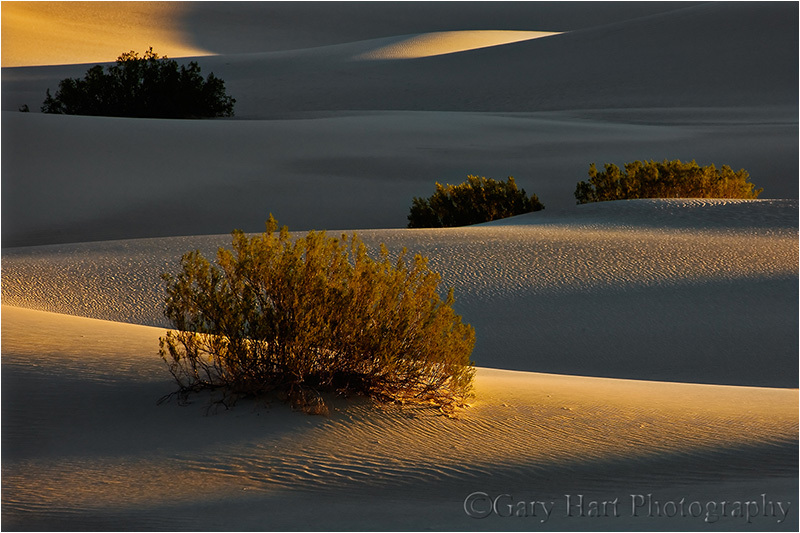 First Light, Mesquite Flat Dunes, Death Valley: On most mornings, direct sunlight skims Mesquite Flat Dunes' sandy undulations, etching straight lines and graceful curves that photographers crave. 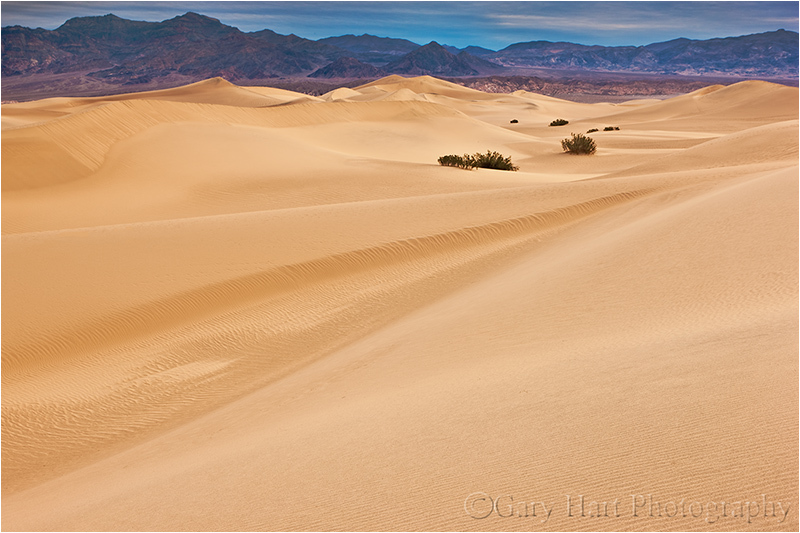 Death Valley’s Mesquite Flat Dunes are gorgeous when the day’s first light peeks over the Funeral Mountains and skims the dunes’ pristine ridges and curves, casting extreme shadows that exaggerates everything wonderful about sand dunes. In an arid environment that rarely sees clouds, these dunes near Stovepipe Wells are a must-shoot for serious photographers. But I’m afraid in their desire to duplicate the beautiful, high-contrast sunrise images that have preceded them, photographers overlook the possibilities when the sun doesn’t arrive. I love photographing sand dunes beneath cloudy skies, and can’t understand the disappointment I hear when dune photographers (who should know better) lament cloudy skies. I realize overcast doesn’t offer the kind of bold shadows that create the dramatic images everyone else has, but as someone who constantly looks to photograph things a little differently than others have (of course that doesn’t make me unique), I just love these dunes in more subdued light. I’d selected a relatively remote location that tends to offer a better chance of solitude and sand unmarred by footprints. Getting there is slightly more work, but nothing more than anyone in the group could handle. The slightly extra effort turned out to be worth it, as we found only a handful of footprints and saw no other photographers while we were out there. While it was still fairly dark as we scaled the final dune and prepared to set up, flashlights were no longer necessary. Not only is shadowless twilight vastly underrated for photography, starting early gives everyone a chance to familiarize themselves with the scene before the sky starts to light up, so I encouraged everyone to start shooting as soon as they were ready. As expected, the rising sun never made its way directly onto the dunes that morning, but it did find enough openings to paint the clouds in all directions with vivid reds and pinks, a rare treat in Death Valley (and an unexpected bonus). The image at the top of the page was captured about forty-five minutes after sunrise–without clouds, the best light would have been long passed by then. To emphasize the delicate, repeating ridges in the sand, I dropped my tripod as close to sand-level as it would go, stopping down to f16 and focusing maybe twenty feet in front of me to maximize depth of field. I used the diagonal “valley” in the middle distance to lead the eye through the scene, and because the sky wasn’t particularly interesting, relegated it to a thin strip above Death Valley Buttes and the Funeral Mountains. All in all, a nice morning, and (I think) a good lesson for all. Outstanding capture, love the lighting effects.